Is putting time and effort into your PR campaign necessary during December? HECK YES! Does it have to be high-stress and consume loads of time and energy? HECK NO! I get it. Beyond decking the halls of your home (and perhaps office) you’re also stuffing customer gift orders, squeezing in last minute client meetings, and trying to check off all the names on your company’s Christmas card list before closing up shop for a few days at the end of the year. I also know that as an entrepreneur or small business owner, shop rarely fully closes, and all of this adds up to most of my readers feeling like busy bees at the best, and some admittedly feel like headless chickens. We’ve all been on either side of this holiday rush spectrum. The thing is, along with all of the to do’s on your lists, it is imperative that you do not let the thought (and work) you put into your public relations campaign disappear until you regroup and “feel ready for it” in mid-January. Do you really want to lose all of that momentum? Are you okay with other businesses (and competitors) slipping into your media spotlight when you step out of it? The news never sleeps. Magazines, websites, and television shows will continue their content creation march through December and early January, whether or not you plan on joining the publicity parade with them! 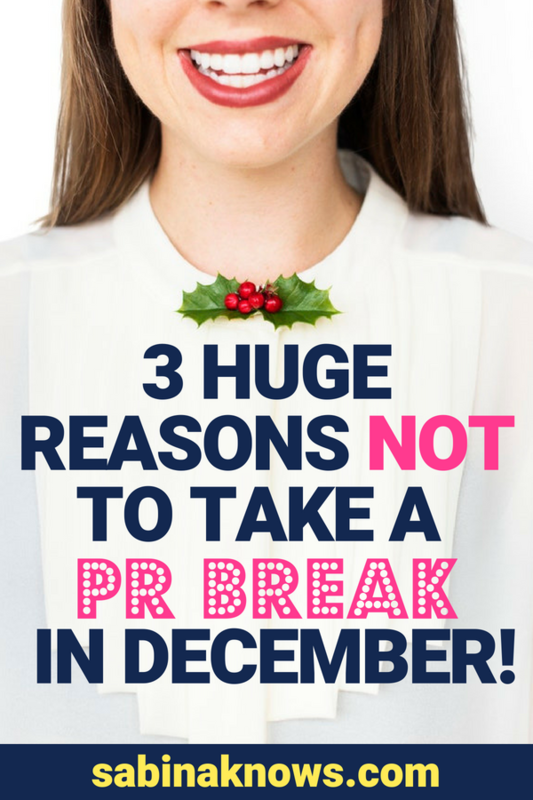 Some of you may think that making PR happen during this time of year is impossible, but then some of you may have forgotten that you have ME on your side, and because I feel so strongly about helping you keep your PR fires burning as the year closes out, I’m going to walk you through three solid reasons you can’t put PR work on pause this holiday season. But that’s not all! After you read my you-better-not-quit-building-buzz list, be sure you’re part of my (free) Press for Success Facebook Community, as throughout the entire month of December I’ll be providing you with examples and action steps that will help keep you visible and moving forward – at whatever pace works for you – so that 2018 sees you moving from “best-kept secret” (not a good place to be when it comes to business) to a product, service, or expert people are buzzing about in the New Year. Also, be sure you’re a newsletter reader as we’re going to be dropping some solid strategy tips and encouragement into your inbox (think of them as mini presents) all season long! If you’re not, sign up here! You are not a bear, you don’t get to hibernate! Instead, let’s talk through three reasons you need to keep building your PR momentum, and how you can do it while enjoying time with family and friends at the same time! Reason 1: Content Creation on TV, Online, and in Newspapers Continues! When you turn on the television during December or early January, do you see a blank screen? Is your newspaper devoid of stories until mid-January? Does the Internet go dark until everyone returns from their holiday vacations? Of course not! That’s because as I said to you above, the news never sleeps. “Short lead press” (television, digital, newspaper, radio) will keep producing stories as the holiday season marches on. Even monthly magazines will be working on stories throughout the first few weeks of December, including Mother’s Day gift guides that will be appearing in spring magazines that are currently in various stages of production! Sure, some of them will be banking stories and be stepping away from their computers for a day or two (while television news will continue to share new stories every day) but most short lead media will be in various stages of planning or production throughout the next month. After all, immediately after Christmas/Hanukkah/New Years, they’re going to be moving into “New Year New You” type stories, Valentine’s Day, and the list goes on and on…Not only is there endless content to create, there are ongoing opportunities for YOU to get publicity at most, and build relationships or name recognition at the very least! What does this mean for you? If you have a product, expertise, or service that can be used in a seasonal or timely story, this is your time to shine and be of value to local or national press. Have something perfect or spring magazine stories? NOW Is the time to begin thinking about that and taking action! Even better? The PR playing field isn’t as crowded during this time of year because some of your less strategic counterparts are declaring it a holiday from PR work from December through early January. Thank them for it, as the road to PR success is going to be much less crowded! Often, when I talk about building buzz and working on publicity, business owners equate those phrases with heavy work like writing pitches and directly reaching out to the media. But to know me as a PR teacher is to know that I value building relationships and media research highly, and prefer you do that long before pressing “send” on a pitch email. For that reason, I suggest that you plan some dedicated time during the month of December and the early days of January to research ideal media “homes” (magazines, websites, news programs, talk shows) for your business, story, product, or expertise. The holiday season is the perfect time to take on media research! Dig into reading through those magazines (perfect during air or train travel or downtime near a crackling fire), flip on your local television news (or watch it online) to see how they cover businesses like yours and begin getting to know the actual humans behind these stories. This isn’t rocket science, folks! In fact, media research can and should be exciting and pleasant parts of your PR work. I actually schedule it into my work day every Monday and look forward to it. I make some tea, curl up with a stack of magazines and Post-its, and go to town! Once you begin to get to know the “who” at the different places you dream of being featured in, spend the next month or so connecting with them on social media. The key ways you can do this exponentially faster than simply “heart-ing” their Instagram posts? Follow their Instastory feeds and message them when a story moves you in some way, comment and engage beyond the heart or like on Twitter and Instagram, and send a “praise email” or “praise Tweet” to them during the next month. I’ve explained how to do just that below. By making relationship building a big part of your PR activity over the next month, you’ll be ensuring that the press don’t forget about you, and instead get to know you more, building name recognition and increasing your chances for emails getting answered when you eventually do pitch them, while at the same time helping your business be top-of-mind when they’re working on a story you could be a good fit for. Listen, I’ll be the first person to tell you to “keep your eyes on your own paper” and stop worrying about what everyone else is doing when it comes to brand and buzz building. But I’m also a realist, and I know that if you decide to step fully away from any type of PR action until early January, you’re not only losing momentum that you worked really, really hard to build, and while you’re falling off the media radar, others will be taking your place on it. Between publicists – who are paid to be sure their clients are in the press as much as possible – and the thousands of small business owners (including my rock star Press for Success students and community members) who are actively working on doing their own publicity work. the more you step away from maintaining ongoing activity and progress when it comes to your PR campaign, the more you’ll just be throwing out a welcome mat for others to take your place. MAKING SURE MY QUARTER 1 PR PLAN IS CREATED: What holidays do I need to prepare pitches for? What do I want to work on for early 2018 and Valentine’s Day? What short and long-lead pitches will I need to prepare for during the first three months of 2018? Plan your work, work your plan, and you’ll be much less frazzled in PR and business all year long! CONTINUING CONNECTING: With media targets, via email and social media. Heck, I may even offer to take one or two to coffee in early January when we all need a dose of energy and have more time to connect in person. RESEARCH, RESEARCH, RESEARCH: Media is changing and evolving every day, which means there are new and different opportunities to share my story and value with the press every month. I also know that curling up with my laptop and getting to know some of my target websites and even my local newspaper, while sipping on a hot tea (or hot toddy) is definitely in my holiday future. My goal of today’s post wasn’t to scare you, overwhelm you, or cause any (more) holiday anxiety. Instead, I want you to understand how important it is for you to remain tapped into the various ways you can keep your publicity plans and dreams moving forward – sometimes with even more luck – during the holiday season. Again, I’m not asking you to work day in and day out (follow my Instagram and you’re sure to see me relaxing with family and friends during the holiday). What I am asking you to do is to make a conscious effort and plan to inject effective and efficient action steps into the next month so that you can reap the benefits in the New Year! The road to success, the path to success, whichever route you take, it’s one that is always moving. We don’t call it the lounge chair to success. The road to success is also rarely as crowded as one would think, as not everyone wants to put in the work required to reach their goals. But guess who IS on your road to PR success? Yours truly! Let me help you make this last month count! No matter how well (or not well) your publicity efforts were this past year, we can still end the year with a bang! Join me in my Press for Success Facebook Community (private, and packed with hundreds of business owners making publicity a realistic and attainable goal for their business) and I’ll spend the next month making sure your path to PR success is strategic and your heart and mind are confident and excited about the journey! See you there!